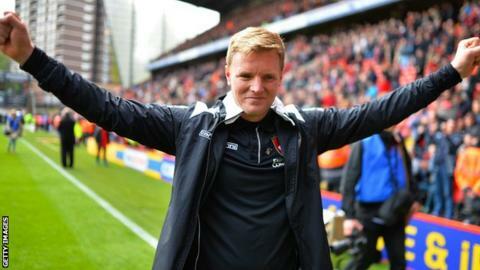 Bournemouth boss Eddie Howe has been named the League Managers' Association manager of the year. Howe, 37, was honoured after leading the Cherries into the top flight for the first time in their history. He also claimed the Championship award, with Chelsea boss Jose Mourinho given the Premier League accolade. Bristol City's Steve Cotterill and Gareth Ainsworth of Wycombe took the League One and League Two honours respectively. Howe is the fifth manager from outside the top flight to win the award since 1992, following Peter Reid (Sunderland) in 1996, Danny Wilson (Barnsley) in 1997, Alan Curbishley (Charlton) in 2000 and Steve Coppell (Reading) in 2006. Howe said: "I can't believe it, I'm so surprised." A former Bournemouth player, in two spells he has guided the club from Football League survival after a 17-point deduction in 2008-09 to the Premier League. First appointed in 2008, he returned to the club in 2012 after nearly two years at Burnley. Liverpool manager Brendan Rodgers, who presented the award, said: "He's done a fine job, a remarkable job, and done it with style and humility." Mourinho received the Premier League award after winning the title with Chelsea for the third time in two spells at the club. Cotterill, meanwhile, guided Bristol City to the League One title, while Ainsworth's Wycombe finished fourth in League Two, losing to Southend in the play-off final on penalties. Last season, the Chairboys only avoided relegation out of the Football League with a final-day victory over Torquay. Several other managers were also recognised on the night. The FA Cup manager of the year award went to Phil Parkinson for Bradford City's win at Chelsea while Danny Wilson was honoured for reaching 1,000 matches as a manager.